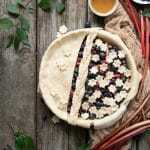 Blueberry Rhubarb Pie has a buttery flaky crust filled with fresh fruit and a hint of cinnamon. The red, white, and blue colors are perfect for celebrating the fourth of July! Make two crusts, wrap in plastic wrap and set in the fridge for 30 minutes while you prepare the filling. In a large bowl whisk together 1/2 cup flour, cinnamon and nutmeg. Gently stir in blueberries and chopped rhubarb pieces with spatula until well coated. Pour in honey and stir softly until incorporated. Roll one pie crust onto lightly floured surface to about 1/8 inch thick 12 inch wide circle. The circle should be a couple inches larger than your pie pan. Carefully place crust into pan and use fingers tips to softly press into the corners, allowing excess crust to lay over the sides of the pan. Spoon blueberry mixture into prepared pie crust. Roll out second pie crust. Cut in half using decorative side of dough cutter. Place this half across the filling, keeping the zigzag patter towards the center. Cut three small strips from the second half of crust. Braid together and lay across the center of the pie. Use your cookie cutter to create shapes with the remaining dough pieces. Place across your uncovered filling in any pattern. Trim excess dough from the edges of the pie pan with a knife. Brush egg wash onto dough and sprinkle with sugar. Place pie pan on cookie sheet and put in the oven. Remove from oven and lightly cover pie with aluminum foil (tent slightly) to prevent burning the crust. Continue to bake for 30-40 minutes. Pie is ready when filling is bubbly and crust is golden brown. Place pie on cooling rack and allow to cool for 15-20 minutes before serving.